You’d struggle to find a non-Beatles album from the 1960’s as influential and acclaimed as “Pet Sounds”. It regularly tops favourite album polls of fans and critics alike, coming in at the number one spot in publications such as Mojo Magazine and New Music Express, while Rolling Stone placed it second in their 500 Greatest Albums of All Time Poll in 2003. It is one of those albums that seems to be reissued every few years with another bonus track and/or unheard gem from the vault. There are several luxury editions available boasting different mixes, instrumentals and alternate takes. It is an album that is continually analysed and deconstructed by faithful followers, and each listen can reveal something new. Band leader, chief songwriter and album producer Brian Wilson credits his inspiration for making “Pet Sounds” came from listening to the Beatles’ wonderful “Rubber Soul” record. He’d never before heard an album of songs that belonged together; all original compositions and none of it filler. Up until the mid sixties, singles were held in higher esteem by record companies as they made more money and required less financial commitment. Albums were used to collect several hit singles together and simply filled with hastily written tracks or covers to enable a quick release, cashing in on the act’s success. The idea of a cohesive group of high quality songs was a new concept and albums like “Pet Sounds” ushered in a new era of record-making. This record contains some classic Beach Boys tracks, starting with ‘Wouldn’t It Be Nice’, a great adolescent anthem for wanting to grow up and be with the one you love. Gorgeous ballad ‘God Only Knows’ features a truly amazing arrangement of vocal harmonies, flutes, accordion, harpsichord, brass and strings on top of the band’s usual drums, bass and guitar line-up. The number of musicians on this recording was unprecedented, and the lush sound they created can be pinpointed as one of the first examples of baroque instrumentation in popular music, also known as chamber pop. Instrumental tracks ‘Let’s Go Away For Awhile’ and ‘Pet Sounds’ are further examples of this successful melding of musical styles. The song was one of the first non-Christian compositions to include God in its title and to allude to suicide at the loss of a loved one. My absolute favourite track is ‘Caroline, No’ which closes the album and features a fabulously tender, emotive lead vocal from Brian. Interestingly, it was originally released before the album as a Brian Wilson solo single, as no other Beach Boys feature on it. I don’t hold this album to be the masterpiece many do; the meandering ‘That’s Not Me’ and the nap-inducing ‘Don’t Talk (Put Your Head On My Shoulder)’ are real low points for me. However, there’s no denying the influence this has had on popular music. The unique instrumentation and groundbreaking production make this unlike any other Beach Boys record before it. I love how the tambourine is showcased, being used to accent and enhance a track, rather than just keep time or fill in sound. There many moments that make this album peerless: the bicycle horn sounding during the fabulous vocal outro of ‘You Still Believe In Me’, the passing train followed by barking dogs after ‘Caroline, No’ and the theremin solo on the great ode to outsiders ‘I Just Wasn’t Made For These Times’ to name a few. 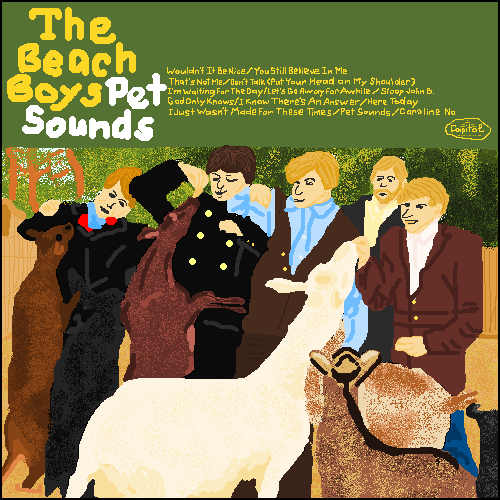 “Pet Sounds” has everything that makes an album a classic along with an iconic, if somewhat daggy, cover. It’s kind of hard to believe, but “Pet Sounds” was recorded entirely on an 8 track recorder, only then newly available in 1966. Initially the musical backing track was recorded on a 4 track which was then dubbed down to 1 track. There was 1 track used for little vocal and instrumental embellishments. That leaves 6 tracks for vocals. That right kids, count them. 2 tracks for music and 6 tracks for vocals. Brian Wilson may be a little crazy, but crazy in a genius way. I’d hate to think how many tracks would be used today to make this album. And this is where I think this album stands above most of its peers of the time. Overall it’s a very pretty album but it’s the risks that Wilson took creatively that makes it worthy of the acclaim it receives. It has its high points (‘You Still Believe in Me’, ‘God Only Knows’, ‘Caroline, No’) and low points (‘That’s Not Me’, ‘I Just Wasn’t Made For These Times’… both of which suffer a bit from the old ‘High School Poetry’), but overall it works because it’s the vision of a man who stuck to his guns and did it his way. And there are hundreds of artists who have gone on to benefit because of this. This isn’t the kind of album you can put on in the background. It demands your attention and, well, it deserves it your attention. “Pet Sounds” reveals itself a little bit more on each listen. Spend some time with it and you’ll understand why it makes so many ‘best of’ lists. Ah, what a great album. I loved this album the first time I listened to it, and nothing’s changed. Interestingly, ‘Pet Sounds’ only made it to number 10 on the American Billboard 200. Although, really, number ten isn’t exactly awful. Although something changed for me this time around. After a few listens, I found myself moving away from the crowd favourites like ‘God Only Knows’ and ‘Wouldn’t It Be Nice’ and leaning more towards ‘Let’s Go Away For A While’. I don’t know what it is, maybe my music tastes are maturing (not likely). Don’t get me wrong, the classic tracks are still genius, I just think with albums like this, there are usually hidden gems that people don’t take much notice of, and ‘Let’s Go Away For A While’ is one of them. One of my favourite aspects of “Pet Sounds”, and I guess all Beach Boys albums, are the excellent vocal harmonies we’ve now come to associate with ‘surf rock’ style. The Beach Boys really made the 60’s sound like a fun place to be! I also like the fact that all the tracks are quite short, which is excellent for someone with a short attention span such as myself, the longest track being ‘I Just Wasn’t Made For These Times’. I think The Beach Boys might have been hipsters before being hipsters was cool. Their instrumentation was creative to say the least. How rad are theramins? Bicycle bells, harpsichords, dog whistles, trains and coke cans were all used in recording. Come on, own up. Hands up if you didn’t hear a harpsichord? Shame on you. Just as an interesting side note, the Beach Boys released 15 albums in the 1960’s alone. Three albums in 1963. Take that, Guns N Roses. Well, we’re 3 reviews in and I’m already realising just how naive I am, and how much more I have to learn about music despite having studied it for most of my life! I was surprised that apart from Track 1 (‘Wouldn’t it Be Nice’), the album seems to be somewhat of a departure from the carefree, sunny sound that I have come to associate with The Beach Boys. Before hearing “Pet Sounds”, I had only really ever heard what I would term the Greatest Hits, and I guess I’ve always thought that there’s a time and place for The Beach Boys, namely holidays and themed parties. I now have a greater appreciation for what The Beach Boys did for music (in particular studio recording) and today. I really enjoyed the experimentation with unconventional instruments such as bike bells, banjo’s and the baroque-style melodies, the clever use of organs, and of course the sophisticated vocal patterns and harmonies. Extra points for the bold and bright use of percussion, particularly on ‘I Know There’s An Answer’ (my fav track), and the successful use of dissonance between the vocal track and the instruments (‘Here today’). The word ‘influence’ tends to be overused in music reviews, but seriously, this band helped shape not only the sound of contemporary music, but also the way in which it was recorded. Just listen to it – at least once – you owe it to your musical education.